To use WooCommerce in full volume you have to create main pages which will display products and checkout process. Later you will be able to customise view of such pages: add shortcodes, blocks, change view of a page etc. So, you have to create service pages for Woocommerce functionality and set them in WooCommerce. -Shop — empty, there is no shortcode. For example, for page Shopping Cart. Don’t forget to press the button Text. And only in Text field write shortcodes. P.S. 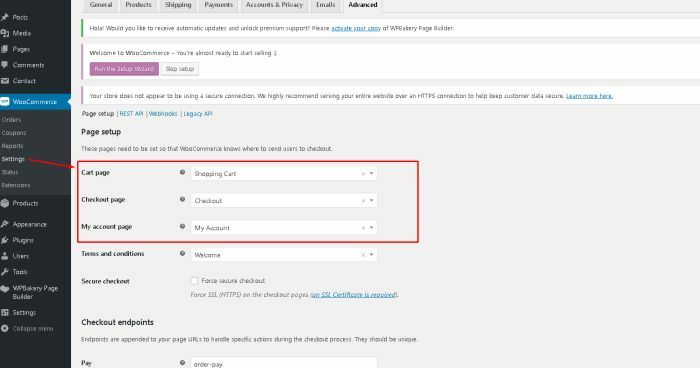 just in case, check in default WooCommerce manuals if above shortcodes are actual for the time of reading the article. 1-2) go in left menu: Woocommerce — > Settings -> Products -> Shop page, choose created Shop page. And go in left menu: WooCommerce — > Settings -> Advanced and choose other pages in corresponding fields. If you are a developer or simply need to check how your theme looks on shopping pages you can import default WooCommerce demo products. You don’t have to search the files for import elsewhere. They are located in the default plugin package in the path: your_site_name/wp-content/plugins/woocommerce/sample-data/. For example, import only products with images — use file — sample_products.csv. To import file go in admin left menu: Tools -> Import -> choose WooCommerce products (CSV) -> Run Importer and choose the corresponding file. — To edit Listing options go in admin left menu: Appearance -> Customise -> WooCommerce -> Product Catalog. — To edit Product Page image size go in admin left menu: Appearance -> Customise -> WooCommerce -> Product Images. And play with images look on your site. After plugin is activated find them in admin left menu: Tools -> Regenerate Thumbnails. And, finally, to have opportunity to sell your products set Shipping, Payment options in admin left menu: WooCommerce -> Settings, open each tab Shipping, Payments etc.